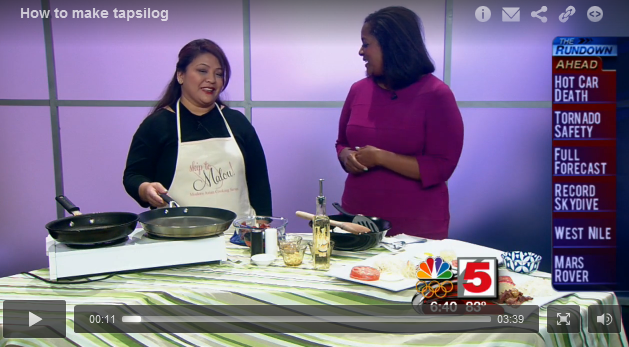 I am sharing with you the link to my guest appearance on KSDK 5 St. Louis, an NBC affiliate. I still can’t put together the right words to describe the experience, as I am still overwhelmed by the exciting experience. All I know is that I had a fab time… never mind if I had to wake up at 4 AM and drag along my husband and son in tow (thanks guys for the support). I also would like to thank the people of Channel 5 for having me: the anchor, Kelly Jackson, who made me feel so at ease on cam; meteorologist, Chester Lampkin, whose mom I found out is from my hometown of Tuguegarao (btw people of Tuguegarao, Chester is planning to visit soon); and of course the friendly staff… thank you so so much. So I’d like to share with you, my dear Foodipino friends, my short appearance on TV. I take pride in sharing our Filipino Food and spreading the joys of cooking it. Click here to watch the video. You may also want to check my other Tapsilog recipe here. To the staff of Foodipino and Definitely Filipino, Maraming Salamat. To all the my Foodipino friends, I would like to invite you to come join me in Facebook or Twitter Maraming Salamat din sa inyong lahat! Tremendous issues here. I am very happy to peer your article. Thank you a lot and I’m looking forward to contact you. Will you please drop me a e-mail?